Who is the Nutrition Watchdog? 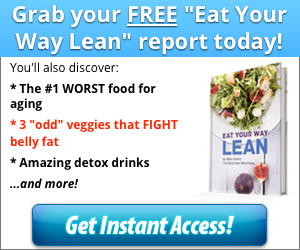 1 Odd trick to FLATTEN your stomach while driving? Black seed oil, or Nigella Sativa, comes from the seeds of the Nigella Sativa plant. Native to Asia, historical accounts date the use of its seeds as far back as ancient Egypt. Folklore from the surroundings regions, including Indian and Arabic civilizations, refer to the tiny seeds as “Habbatul barakah” (seed of blessing) for their ability to ease indigestion, treat asthma, bronchitis, rheumatism, diarrhea, and even energize the body and ease “dispiritedness” (1). 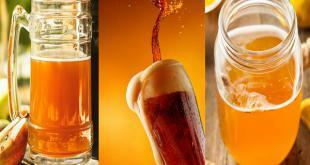 Today, these claims seem to withstand the tests of an impressive amount of present-day studies. 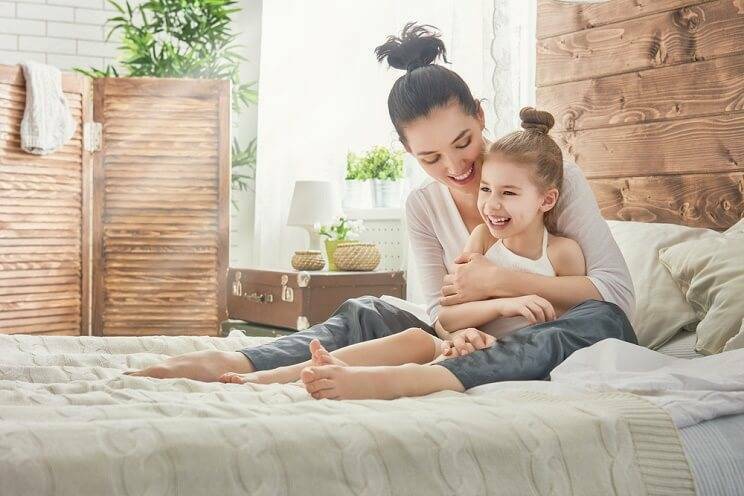 Black seed oil’s main phytochemical compounds, thymoquinone, thymohydroquinone, and thymol, have been shown to have an astounding number of benefits, from being potent antifungals to possible contenders in the fight against Alzheimer’s and autism (2, 3). 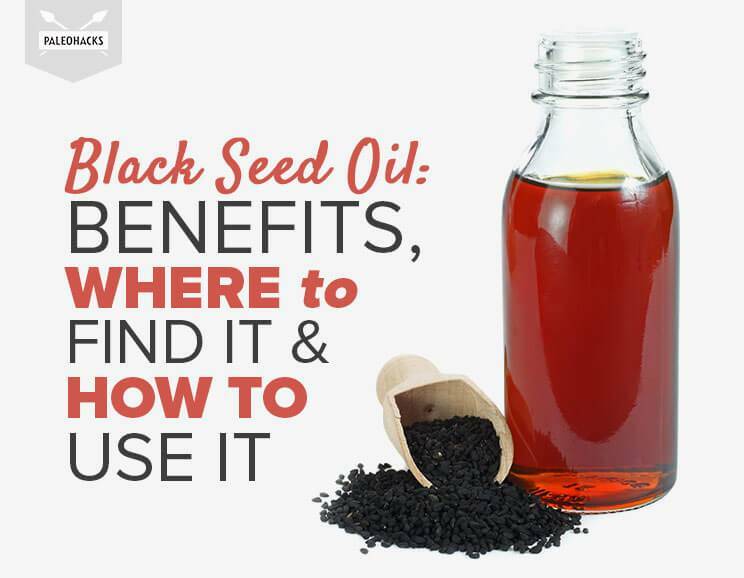 Below we’ll take a look at the top nine benefits of black seed oil, breaking down exactly why these little seeds hold so much power. Black seed oil shows huge promise when it comes to preventing and managing both type 1 and type 2 diabetes. One study out of the Indian Council of Medical Research found that black seed oil actually caused a partial “regeneration” of pancreatic cells, lowered previously elevated serum glucose levels, and lowered serum insulin concentrations (4). In the same study, researchers also mentioned that black seeds improved glucose tolerance as well as the major type 2 diabetes drug metformin without the nasty side effects of stomach pain, bloating, headaches, heartburn, and flushing (5). Of course, you’ll want to speak to your doctor before quitting any medications. If research has anything to say about black seed oil, it’s that it is a potent cancer cell fighter. 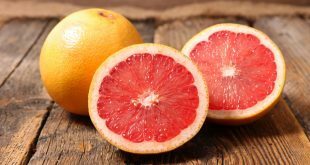 Studies have shown its active compound, thymoquinone, reduces malignant colon tumor sizes, induces cell death in pancreatic and breast cancer cells, and has anti-metastatic actions (i.e., helps stop the spears of cancers) (6). One study also mentioned that the combination of thymoquinone with standard cancer treatments like chemotherapy could actually reduce the toxicity of chemo and make treatments more effective (7). Combined with chemotherapy, black seed oil can make cancer treatment more effective. Interestingly, scientists from another study mentioned that thymoquinone and thymohydroquinone’s antitumor effects may be dose-dependent, stating: “The results indicate that THQ antitumor activity may be improved with further dose increase of the investigated substance.” This was after also discovering that these two compounds resulted in a 52 percent decrease in tumor cells (8). Now, we all know that the positive results of these studies don’t necessarily mean that black seed oil is a definite cancer cure for everyone. However, it does give us a great starting point in using this oil as an alternative treatment. Black seed oil has been shown to protect against liver damage from hepatic ischemia reperfusion injury while also protecting liver tissue against the effects of toxic metals. It has even been shown to create a protective effect against radioactive chemicals, including cadmium, by rejuvenating the antioxidants that were depleted after exposure to the chemicals (9). Black seed oil has also been shown to have powerful anti-inflammatory effects. Osteoporosis (which is heavily linked to inflammation) is just one of the ailments researchers put up to bat against black seed oil, and they found that its thymoquinone content inhibited a wide variety of substances that cause inflammation (10). In addition, scientists also discovered thymoquinone’s ability to inhibit molecules that cause allergic airway inflammation in the lungs (the kind that you might experience in an allergic reaction) (11). Applying black seed oil topically also appears to have endless benefits. In the case against acne, researchers discovered that application of the oil resulted in reduction of lesions in just two months, attributing the results to black seed oil’s antimicrobial, immunomodulatory and anti-inflammatory effects (12). Apply black seed oil topically to reduce acne. In a separate study, black seed oil was also shown to inhibit skin cancer cells in mice; it delayed “papilloma formation and reduced the number of papillomas per mouse” (13). The fact that black seed oil is anti-inflammatory and shows a good amount of antioxidant activity also makes it great for use as an anti-aging moisturizer. Antibacterial and antifungal resistance is a well-known problem in the medical field today. As a result, scientists have started looking outside the box of traditional western therapies (i.e., antibiotics) for answers. Black seed oil emerged as one of the most promising. Researchers in one study discovered its active components thymol, thymoquinone, and thymohydroquinone were 100 percent effective in inhibiting 30 different pathogens (14). It has also been found in several other studies to inhibit the growth of candida yeasts and Staphylococcus aureus (staph) infection (15, 16). 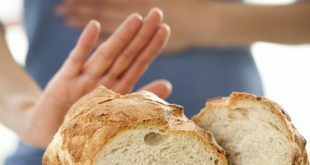 This is powerful news, since candida overgrowth has become very common due to modern diets high in processed sugars, as well as the fact that staph infections are also common in hospitals. 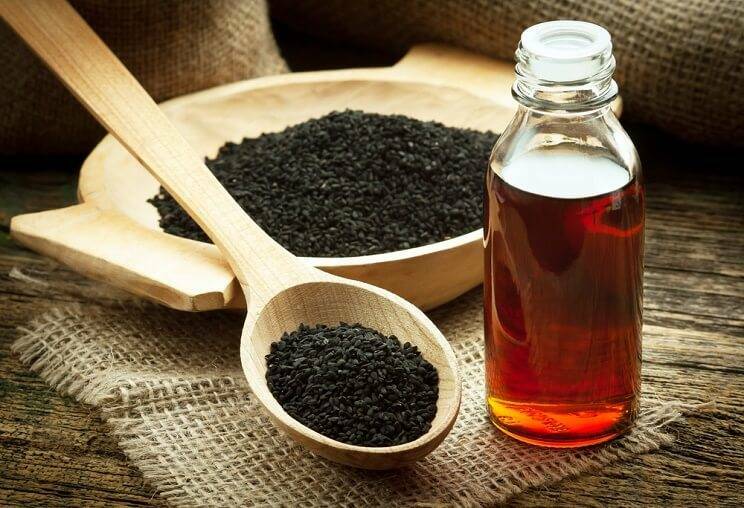 While oils aren’t the first substances that come to mind when we think of weight loss, it turns out that black seed oil could play a role in fighting obesity. Researchers believe its ability to improve glucose tolerance, enhance liver health, decrease inflammation, and regulate glucose levels all play a role in helping the body return to a normal weight. Black seed oil regulates glucose levels, helping you lose weight! After all, our ability to optimize our glucose levels and use carbohydrates efficiently plays a huge role in obesity and insulin resistance, so weight loss could be a likely side effect of improving these factors (17). And the best part about optimizing our glucose levels? No fad diets required! Consuming black seed oil may also be an effective way to naturally increase your immunity. Studies show black seed oil enhances natural killer T cells (cells that fight viral infections) while also having the ability to restore resistance against lethal infections (18, 19). Black seed oil’s effect on the immune system is even powerful enough to protect against radiation. One study found, “N. sativa oil is a promising natural radioprotective agent against immunosuppressive and oxidative effects of ionizing radiation” (20). Black seed oil also appears to be an effective remedy against allergy symptoms. One study found that patients suffering from allergic rhinitis (and everything that comes with it, like runny and itchy noses, sneeze attacks, excess mucous and congestion) found relief after being exposed to black seed oil for just two weeks. Researchers attributed these results to black seed oil’s powerful anti-inflammatory effects (21). 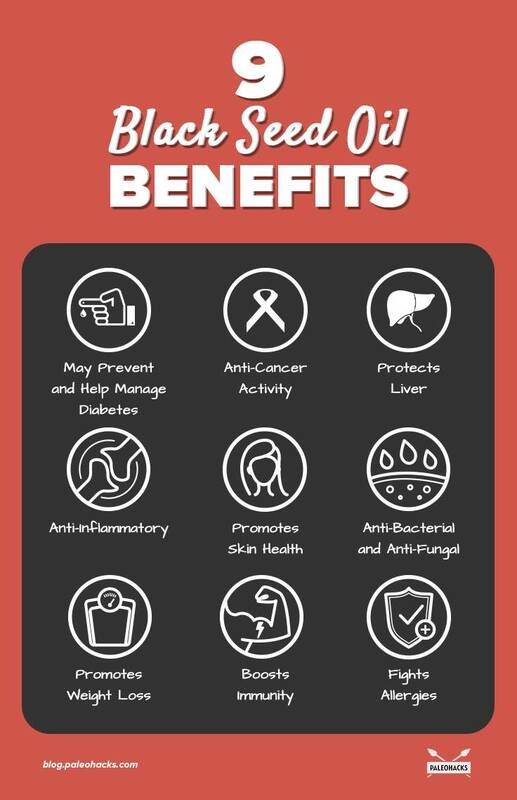 With benefits like these, it’s safe to say we’re all looking forward to cherishing a bottle of black seed oil for ourselves. Luckily, it can be purchased online directly with Activation Products Black Seed Oil or through sites like Amazon. Various health food retailers may also carry black seed oil capsules, if you’re looking for something in pill form. Also keep in mind that black seed oil has a number of different names, including black oil, black cumin oil, etc., so be sure to check the ingredient list for purity before purchasing. 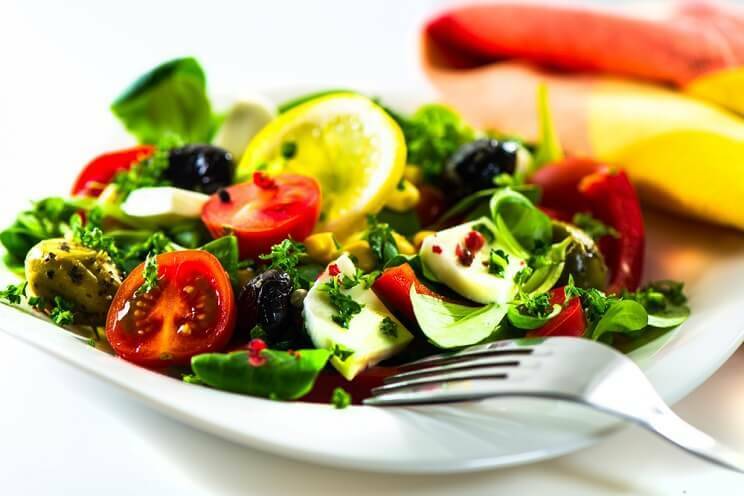 For internal use, you can either take a teaspoon or tablespoon of black seed oil straight, or drizzle it on a salad or on veggies in place of olive oil. For skin and hair, this oil makes an excellent moisturizer. Apply to a clean face to use as a nourishing moisturizer at night, or apply to scalp and hair ends for a few minutes before showering to boost shine. The amount of studies on black seed oil are not only impressive, but the fact that most of them show significant positive results is extremely encouraging for researchers looking into ancient methods of healing. After all, the discovery of black seed oil and its proven benefits have shown us there is credibility to ancient medicinal writings and techniques. Mike Geary has been a Certified Nutrition Specialist and Certified Personal Trainer for over 15 years now. He has been studying nutrition and exercise for almost 25 years, ever since being a young teenager. Mike is originally from Pennsylvania, but has fallen in love with mountain life and now resides in the picturesque mountains of Utah. Mike is an avid adventurist and when he’s not spending his time skiing, mountain biking, hiking, or paddleboarding on the lake, he has enjoyed skydiving, whitewater rafting, piloting an Italian fighter plane (seriously), scuba diving, heli-skiing, and traveling all around the world, enjoying learning about different cultures. At the age of 40, Mike now feels healthier, stronger, and more energetic than when he was 20... All because of a healthy lifestyle and great nutrition! 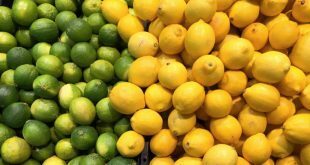 Lemons vs Limes, which is healthier? The main chemicals contained within these seeds are “thymoquinone” and “thymohydroquinone” which are the main elements that provide such wonderful healing effects. I. Hold the buy the oil where I live butvcould buy the seeds and my son (age 2 at the time) had Mrsa.on his legs he would cry from the pimple like boils ….but I gave him a spoonful of the black sesame seeds he feel repel for his nap and 2 hours later with the pain and boils all gone!!!! I don’t know what happened to my words… they are all jumbled up. That is so 😎 awesome! My son has struggled with the same! Thanks for the good article. I haven’t heard about black seed oil before and it’s compounds/ benefits sound promising. I USE BLK SEED OIL AS A VITIMINS. Thank you for the information. It is so refreshing to find an article that doesn’t contain a video message. I’m sure they mean well but I don’t have that kind of time. Thanks again!